The grass may always be greener on the other side of the fence, but, for Hummingbird Wholesale, so is the building. The seven-year-old, Eugene-based organic bulk food distributor is putting the finishing touches on its new digs: A completely renovated 36,000-square-foot warehouse about two blocks away from its old location at 254 Lincoln St.
Not long ago, the monolithic corrugated metal structure was poorly insulated, sported green paint and few windows, had 24,000 square feet of floor space on a single floor and housed Down to Earth, a local home and garden goods retailer and distributor. Now the former warehouse — bought for $1.39 million last August — is two stories, “barn red,” fully insulated with rows of windows and rife with sustainable materials and hardware. Blueprints allot the company 19,000 square feet of floor space, while tenants and community areas will make up the rest. Hummingbird’s owners, Charlie and Julie Tilt, hope to move their headquarters to the new site at 150 Shelton-McMurphey Blvd. by late September. Averaging 20 percent growth a year, the 6,900-square-foot building the company now occupies has begun to stretch at the seams. In anticipation of the move, Hummingbird has already hired three new full-time and one part-time employees. This puts the growing business’ work force at 29, including two owners and six part-timers. Tilt said the company will also likely need two more full-time employees in the coming year. Before the roughly $1.5 million renovation began in January, Tilt envisioned the building as a comfortable, communal space. And with its community meeting rooms, shared kitchen and bathrooms, large windows and skylights and wide hallways all starting to take shape, the renovation reflects this ideal. The owner even has plans to host a farmer’s market under the front awning. The building will include manufacturing, storage, office and retail space. The Tilts have lined up two confirmed tenants so far — Rolf Prima, a performance bicycle wheel manufacturer, and Not Your Mom’s Sandwich Shop. 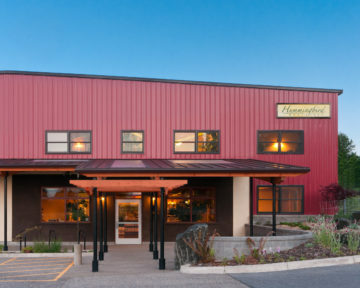 The warehouse still has about 3,000 square feet of unleased tenant space upstairs and 1,400 square feet downstairs, for which Hummingbird is considering prospective tenants. Nir Pearlson, the project’s architect, said that although he worked many sustainable construction practices into its design, he mainly focused on how employees and customers would interact with the building. “We wanted to create a space where people come to work whistling in the morning,” Pearlson said. Even so, the warehouse is still well on its way to looking — in the architect’s words — “organic.” The front entrance to Hummingbird’s section of the building will have a straw bale wall, and the interior’s finished wood beams and floor planks will be left uncovered. On the second story, walls have been built around the warehouse’s original truss rods, now exposed 7 feet from the floor. Concrete cut out from the old warehouse floor will be integrated into its perimeter of garden beds and retaining walls. Employees will also have access to communal showers as an incentive to bike to work. The roof will be lined with photovoltaic solar cells and hot water panels, both of which, Tilt said, will pay for themselves in less than five years if tax breaks are included. Similarly, the added insulation has an approximate payoff period of 15 to 20 years. The building’s backup power generators can run on biodiesel made from in-house food waste. Tenants will have individual electricity, gas and water meters — an incentive to conserve energy — and will share in the benefit from the building’s energy saving features. As the growing season comes to an end, pallets of Oregon and California grown grains and nuts will soon be forked through loading docks on the warehouse’s south end and divided into smaller portions in Hummingbird’s production room. Cool 55-gallon drums of Willamette Valley honey will be placed in Hummingbird’s honey-warming room to become less viscous before being divvied up into small containers. Blueprints call for the room to be warmed by solar-heated water pumped through looped hoses in its cement floor. Across the hall, an industrial-strength granola dehydrator will be equipped with energy-saving heat recovery ventilation to transfer heat between outgoing warm and incoming cold air. Posted in Commercial, News, Publications and tagged PV, Solar.